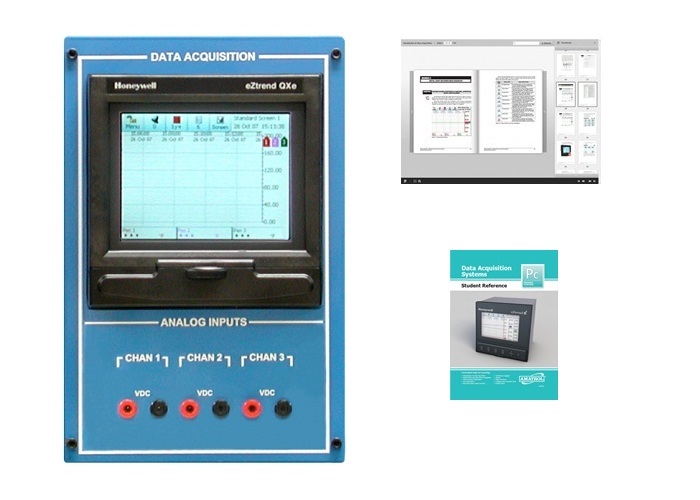 Amatrol’s Three-Channel (T5554-R1A) Data Acquisition Learning System adds to the T5554 Analytical Process Control Learning System to teach the fundamentals of data acquisition. Data acquisition systems consist of equipment used to receive, record, and analyze process data. A chart recorder is one of the most commonly used pieces of data acquisition equipment. Chart recorders create a graphical representation of an electrical input signal received from an input device and provide an on-screen display of the process results. Chart recorders are used in manufacturing to display one or more process variables such as temperature, flow, level and pH, as well as their changes over time. Students will learn how to use chart recorders to collect and display process data. Students will also learn how to use computer software to view and manipulate the data. The T5554-R1A includes a Honeywell eZtrend chart recorder, Honeywell TrendManager software, 10-Ohm precision resistor assembly, supplemental CD, student curriculum and teacher’s assessment guide.